“He had, says someone in Peter Bogdanovich’s documentary The Great Buster, “a face you could paint your feelings on.” The legendary silent-movie comedian Buster Keaton was known as “The Great Stone Face” for his trademark deadpan, but his expressive, just-keep-swimming eyes told endless stories. 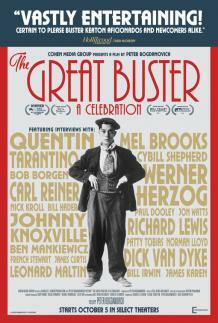 “The Great Buster, a thoroughly entertaining film, takes us through Keaton’s history — a life that spanned the formative years of the film industry. Born Joseph Frank Keaton in 1895 to traveling vaudevillian parents, he learned physical comedy through time spent being flung around on stage as part of the Keaton family act.